Your start to becoming the next Regiment member! Thank you for your interest in the Phantom Regiment! Please take the time to read all of the information located on this page. 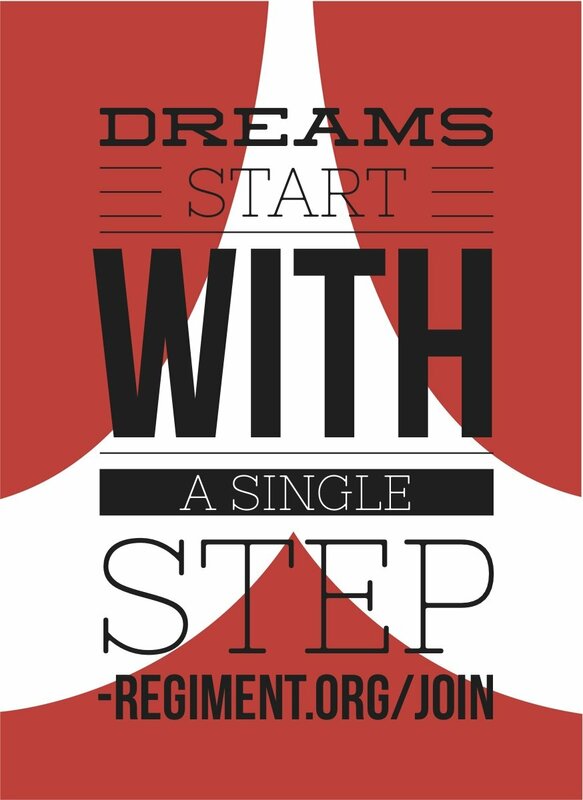 If after doing so, you still have a question regarding auditions – please contact us at membership@regiment.org. By visiting this page, you’ve taken the first step to being a member of one of the most renowned drum corps in the world! We wish you the best of luck and look forward to seeing you in Rockford! Please note: If for some reason you are unable to make the first audition camp, brass and percussion players may attend their respective following camp to audition for any remaining open positions. Conductor auditions ONLY take place at the initial audition camp. Guard members should email us if they cannot make the color guard audition camp. Also, for those that do not know, Beloit, Wisconsin is near Rockford. This option is for those that are interested in only our Audition Information Packet. Once payment is received, you will be sent the audition informational packet that details the entire audition process for your section, as well as general membership information. This is only a request for the Audition Information Packet, and does NOT register you for auditions. If you choose to audition, you will still need to pay the full registration fee. To purchase this option – continue here. Here is your chance to get help from a member of the Phantom Regiment instructional staff, before you audition. With this package, you will have the opportunity to submit 2 videos of you performing specific assignments and a member of our staff will critique your performances with detailed suggestions for improvement. Step 1. You will receive information on how to create and send your video to the instructor. You will also be given specific assignments from the Audition Packet, to perform, with instructions and helpful hints on how we would like them performed. Step 2. Within 5 days, you will receive detailed feedback from a member of our instructional staff, including a custom designed 2nd assignment for you to complete. Step 3. You will complete the 2nd assignment and submit it for critique. Step 4. Once again you will receive detailed feedback from a member of our instructional staff, with suggestions of continued improvement. NOTE: This option is only available until 10/31. If you plan on coming to auditions, see Option D below. This option is for those that would like to audition. This registration fee also includes the Audition Information Packet. * NOTE: After 10/31, the price increases to $125. This option is for those that would like to audition AND receive pre-audition feedback. This registration fee also includes the Audition Information Packet. The pre-audition feedback is your chance to get help from a member of the Phantom Regiment instructional staff, before you audition. With this package, you will have the opportunity to submit 2 videos of you performing specific assignments and a member of our staff will critique your performances with detailed suggestions for improvement. * NOTE: After 10/31, this option is not available. After 10/31, the price increases to $125. These audition camps are not just a walk-thru audition. You will experience what it’s like to be a part of the Phantom Regiment during the entire weekend. These are overnight camps (two nights exactly) in which housing (gym floor at local high school) will be provided. We will also provide breakfast and snack – lunch and dinner will be on your own at local fast food restaurants which we will transport you to, or you can car pool. We will also provide you with a free Phantom Regiment audition shirt! You will be seen, heard, and receive instruction from some of the best instructors in the country. You will meet and work with other potential members from all over the world. You will also receive a copy of your audition worksheets with feedback from your instructors. This is a great tool for you whether or not you are offered a spot in the Regiment. You can use this information to improve your marching and playing abilities for future or other auditions. At the end of the weekend, we will notify you of your status. Camp dates are listed below. All camps are mandatory. Membership fees will be finalized soon but will likely be between $3400 to $3700. There are many variable costs that go into the membership dues including: food, transportation; housing; instruction; equipment; insurance; and fuel costs to name a few. You will be required to complete a Sports Physical by February 1st. The color guard will have auditions for female performers only. 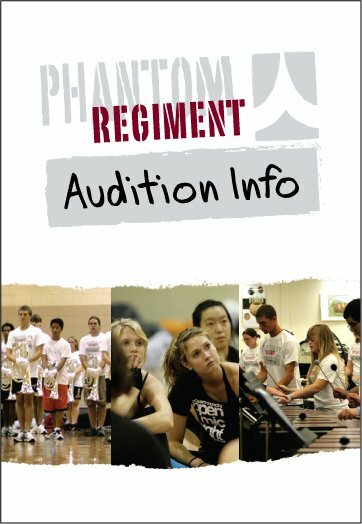 Conductor auditions are open to everyone, regardless of whether or not the person has previously marched in the Phantom Regiment. Conductor auditions take place in one weekend at the brass/conductor camp listed above. If you plan on paying the audition fee at the door, please note that you will not receive the Audition Information Packet in advance, we may not have your free shirt nor will we have your audition sheets printed & ready to go. Contact us for any other questions you might have.